The Falkland Bed, as it’s known today, is the central piece of the Keeper’s Bedroom and one of the first things visitors get to see when visiting the palace. 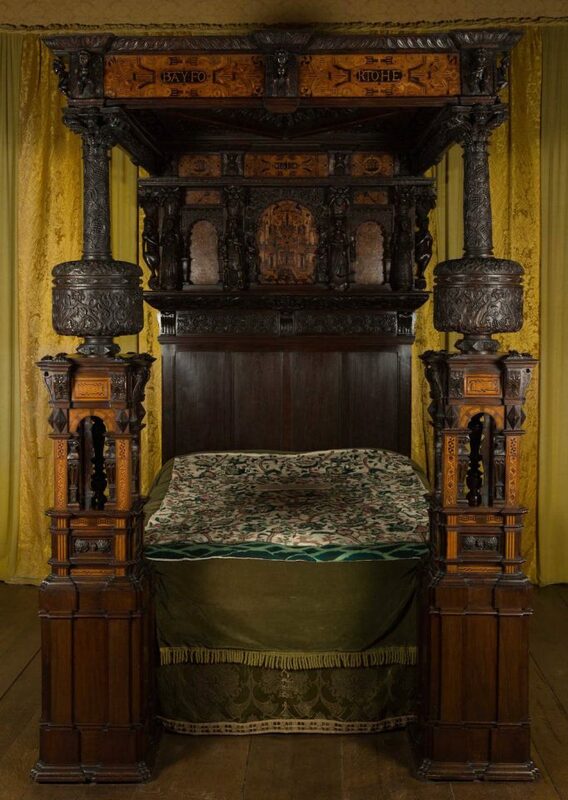 The bed was originally made by Aberdeen craftsmen in 1618, supposedly for King James VI, and has been elaborately embellished over the years with paneling and sculptural work. However, James is unlikely to have had the pleasure of seeing, let alone sleeping in, this wonderful bed as he made only one visit back to Scotland, in 1617. Thankfully this hasn’t taken away from its beauty, which leaves many visitors (and Project Reveal team members!) in awe. Carved from oak, with beautiful fruitwood and ebony marquetry, this bed is a particular talking point for both guides and visitors. 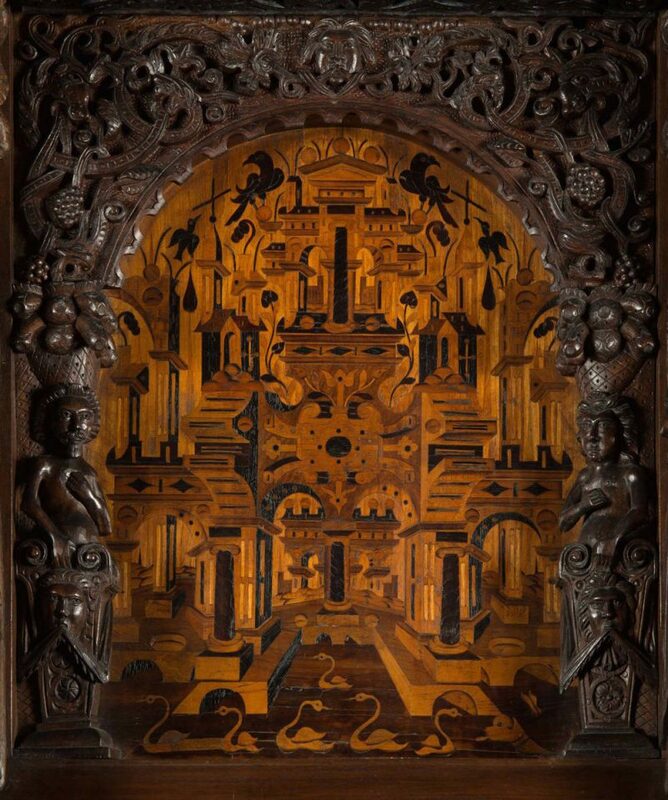 While its elaborate carvings can be open to interpretation, we wanted to highlight some of our favorite features. 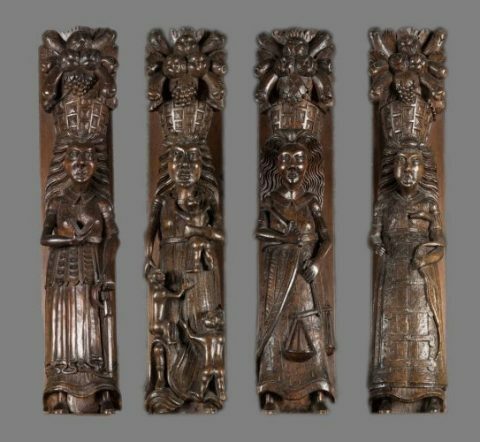 From left to right, the figures of Faith, Charity, Justice and Chastity. At the top of the bed head stands four female figures, representing Faith, Charity, Justice and Chastity. Faith is depicted with a Bible and an anchor, common symbols of Christianity and piety. Religion was fundamental to James VI’s personal and political life. He wrote The True Law of Free Monarchies, stating his belief in the divine right of kings, and was responsible for the King James Bible, which is still used today. Charity is shown here with three small children. Perhaps coincidentally, at this point James VI had three surviving children of similar age: Henry, Prince of Wales, Elizabeth, who was born at Falkland Palace and would later become Elizabeth of Bohemia, and the future King Charles I. Justice is next, recognizable with the balanced scales, while Chastity is depicted with a long snake over her shoulder and what looks like a padlocked skirt. The four female figures are flanked by two satyrs – part-man, part-beast creatures from Greek mythology. The central image of the canopy draws the eye in to an ancient scene of a town or city. It may be a religious site as it’s flanked by Adam and Eve, but we can’t be certain. It could be the Temple of Jerusalem, an important site for both Christians and Jews, but it’s equally possible that it’s not meant to be anywhere in particular. Either way, look closely and you’ll see the houses continue further and further into the distance, as if they never end. The artistry is mesmerizing. The detailed marquetry image, created from ebony and fruitwood. Dominating the exterior of the canopy, painted around the top panels of the bed, are words easily mistaken for Latin but which are in fact Old Scots. They read ‘Fere God His Will Obay For To Heven It Is The Waie’ – further reminding any occupants of the bed of the importance of religion at the time. One more interesting section inside the canopy, pointed out to us by a room guide, is an image of a mythical creature, probably a dragon, surrounded by fire and smoke. Alongside it are runic symbols, an ancient and difficult to decipher form of language. So far, only one symbol has been agreed upon: ‘gate’, but there is no context for its relevance. We hope that one day someone will be able to decipher more of these symbols and reveal their meaning. A beautiful and fascinating piece inside a glorious palace, the Falkland Bed has provided an intriguing start to Project Reveal East Team’s work at Falkland. As visitors continue to marvel at its intricacy and complexity, hopefully more of the bed’s hidden meaning and stories can be unearthed. This article was written by Lorna Weir, Victoria Lambert and Christophe Brogliolo apart of Project Reveal. Project Reveal is a multi-size digitization project of unprecedented scale. 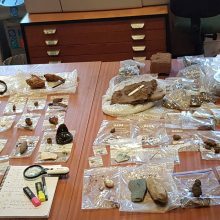 It will result in an updated database with high quality images and unique object numbers for every item in the Trust material culture collections. With your support, we can help the Trust manage its collections more effectively. Most important, we can help the Trust discover, better understand and share its treasures with the world.